Grazing Management Systems Pty. Ltd. is fully aware of the remarkable potential of our technologies and protocols for creating highly profitable agribusiness models, with strong benefits in terms of land appreciation and - potentially - the opportunities offered further into the future with the Kyoto protocol. Many individuals have approached us with regards to this and we have now decided to concentrate on providing exciting products for individuals and companies that wish to invest in Australia's future prosperity. With regards to this, we are presently developing a number of financial plans that will allow investors an opportunity to secure a strong financial return over the long term whilst simultaneously investing in the future of a more environmentally viable, stronger Australian rural sector. We are discussing various ideas with a number of major Australian financials institutions. Many of these projects will become more attractive when certain State and Federal government taxation issues are resolved; thus we are commencing an active lobbying campaign that will ensure all Australians will be able to secure their own financial futures with government support whilst at the same time securing the economic health of the Australian rural sector. We intend to permit investors, both small and large, to tailor a package that will suit their own needs. We intend to offer flexibility and security of return that will make our products a very attractive investment. As we are just commencing, much work needs to be done. 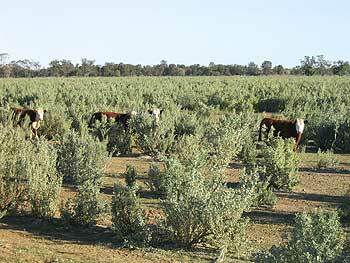 Rest assured, however, we are committed to ensuring that all the benefits of our Oldman saltbush and holistic management technologies are made available to help all Australians secure their futures.